Mary: A Biblical Walk with the Blessed Mother is an eight week Scripture study which we will begin the Wednesday after Labor Day, Sept. 7 at 6:30PM in the Activity Center. The 8 Wednesdays will carry s through the end of October (Oct. 26). This study is an extraordinary pilgrimage that reveals Mary’s unique role in God’s Kingdom and in our lives. Filmed on location in the Holy Land, Mary: A Biblical Walk with the Blessed Mother will place you in the midst of the powerful drama of her earthly life, taking with you through her joys...and her sorrows. You will learn how she works in our lives today, drawing us ever closer to her Divine Son. 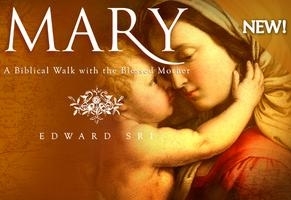 Seeing Mary in this way will change you forever. Mary will become a part of your daily life, and in your daily life, and you will become more like Christ. There will be a 30-minute masterful video presentation by Dr. Edward Sri each week and group discussions to follow. The sessions will be 1 1/2 hours. The cost of the book is $25. If you wish to register for the class E-mail or call Sandra Mistretta at sandmist@bellsouth.net or 225-473-4341 or give your information to Dana at the Church office. If you are an adult Catholic, out of high school over 18 years of age, and you have been baptized, made your First Communion, but have not been confirmed, our Adult Confirmation Preparation Process is available for you. There is no fee, you only need a sponsor and your own commitment. or our church office at 225-473-3176. - The following situations either prevent or delay the celebration of Confirmation and must be resolved before Confirmation is conferred (although they may certainly participate in the Confirmation preparation): Married outside the Church or Married outside the Church and in need of an annulment.